Due to tram track reconstruction in Sokolovská Street, the tram service will be suspended in the Urxova – Palmovka section in both directions, from Saturday, the 5th of March 2016 (at cca. 4.30 a.m.) to Saturday, the 21st of May 2016 (at cca. 4.30 a.m.). Lines No. 3 and 52 are diverted, in the Bílá labuť – Palmovka section, via the stops Těšnov, Vltavská, Dělnická and Maniny. Line No. 8 is, in the direction from Nádraží Podbaba, terminated in the area of the Křižíkova underground station (arrival stop in the temporarily established stop Urxova, departure stop Křižíkova). Line No. 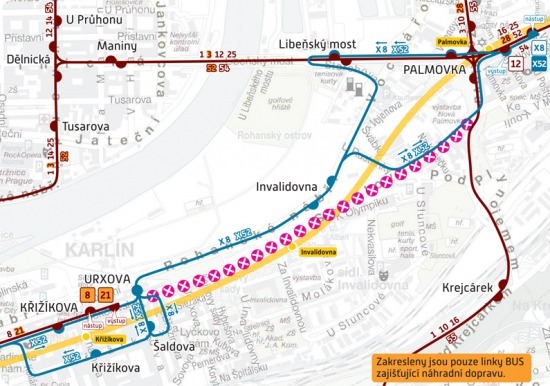 21 on the route Nádraží Braník – Palackého náměstí – Karlovo náměstí – Václavské náměstí – Florenc – Křižíkova – Urxova (arrival stop only). Line No. 28 on the route Březiněveská – Kobylisy – Palmovka – Nádraží Libeň – Starý Hloubětín. For the period of the suspension, the Urxova arrival stop is established in Sokolovská Street, approximately 100 metres before the intersection with Šaldova Street. A replacement bus service line X8 is established on the route Palmovka – Invalidovna – Urxova in daytime operation. A replacement bus service line X52 is established on the route Masarykovo nádraží – Florenc – Křižíkova – Urxova – Invalidovna – Palmovka in night operation.